A presentation from SolarizeCNY in Oswego will provide information on solar energy. OSWEGO, NY – Brought together by the Oswego County Environmental Management Council and the Oswego County Planning Department, SolarizeCNY will hold a workshop presenting information and benefits of solar energy. 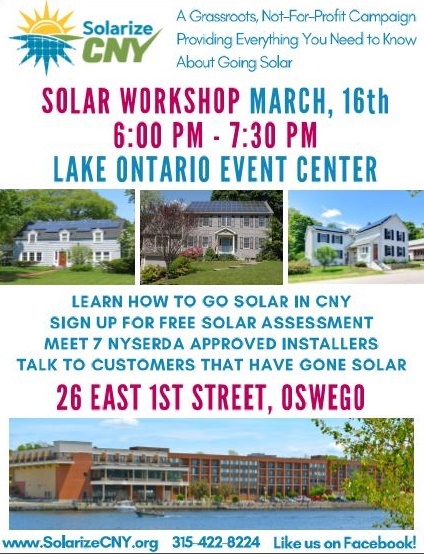 It will be on Thursday (March 16) at the Lake Ontario Event Center located at 26 E. First St., in Oswego, from 6:00 to 7:30 p.m.
SolarizeCNY will give a presentation regarding residential and community solar energy. Residential solar energy is when a solar array is installed on a property owners rooftop or land. In contrast, community solar energy is available for people that are not able to install a solar array on their property for any reason such as people that rent their home, are a non-for-profit, or are faced with obstacles such as unfavorable positioning to sunlight or interference from trees, explained Katelyn Kriesel, SolarizeCNY Communities Project Coordinator. Instead, by using community solar, these people can enter into a power purchase agreement with the owner of a solar array located on communal property. This will allow a percentage of the solar energy production to appear as a credit on the monthly utility bill, typically resulting in a 10-15% decrease in electric bills, Kriesel said. The presentation will highlight a developing community solar project that partners with numerous local municipalities to provide the potential to bring up to 25 MW of solar to the region, and will discuss the information needed when considering solar energy, the financial incentives involved including the NYS grant opportunity and tax credit, and the return of investment. Following the presentation, guests can meet with the seven NYSERDA-approved solar installers, ask any questions, and sign up to receive free solar assessments on their home or business. As a grassroots non-for-profit, SolarizeCNY is “an honest third party,” that vows to help residents go solar while providing the support and information necessary through every step of the process. The benefits of utilizing solar energy go far beyond saving money on utility bills, Kriesel said. “Going solar in CNY has many financial benefits. If you buy a solar array, you will see return on investment whereas if you utilize community solar you will see the decrease in your bill. At the same time, you will be helping to mitigate climate change, support small businesses through our local installers, and be a part of the transition to prioritizing the use of renewable energies,” Kriesel explained. Chairman of the Oswego County Environmental Management Council, Tim Carroll shares a similar stance on the benefits of going solar. As for community solar, the benefits are possible for not just residents but entire municipalities. “With advances to microgrid technology that are likely to occur in the near future, solar will become a viable option for neighborhoods, schools, business campuses, municipalities and such to take more control of their energy costs and distribution. While there are still issues with developing cheaper, more reliable storage devices, and determining what the usable lifetime of a solar installation using today’s technology really will be, I feel the associated benefits outweigh the costs,” he said. The presentation will discuss all of this and more, providing all information for guests to decide whether they want to take the next step with solar energy by enrolling in a free assessment. “I think people just don’t realize how affordable and how helpful solar energy is. It’s fulfilling for me to bring these realizations to people and help connect them with solar energy to save money, support renewable energy, support local installers and the local economy, and increase their home property value. To bring work to our local installers is equally fulfilling so it’s really just a win, win, win for everyone,” Kriesel said. The presentation will happen beginning at 6 p.m. regardless of weather conditions. For those not able to attend the meeting, more information can be found at SolarizeCNY.org where anyone can enroll in a free assessment.